See more objects with the color grey gainsboro darkslategrey dimgrey sienna or see all the colors for this object. This is a Textile. It was designed by Pablo Picasso. It is dated 1955 and we acquired it in 1956. Its medium is cotton and its technique is printed with copper roller incised by photographic process. It is a part of the Textiles department. 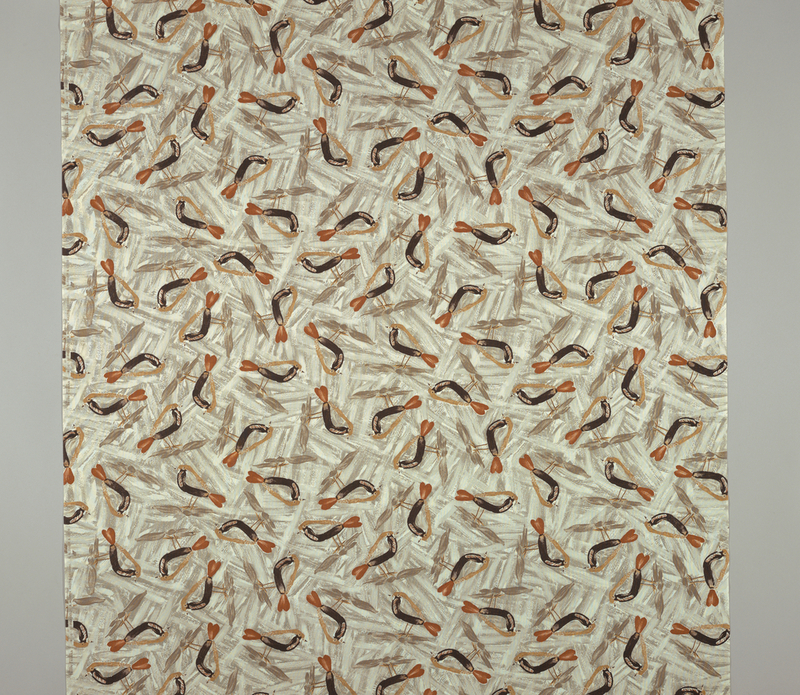 In 1953, Dan Fuller, president of Fuller Fabrics, invited five of the 20th century’s most distinguished artists: Pablo Picasso, Fernand Léger, Marc Chagall, Joan Miró, and Raoul Dufy, to collaborate on a line of textiles to be called the Modern Master Series. The concept was unique in that the artists were not commissioned to produce original patterns specifically for the textiles. Instead, Fuller worked with each artist to select motifs from their existing body of work, which were then translated by the company’s in house designers into repeating patterns. Fidelity of reproduction was essential, and Fuller’s designers worked diligently to render the motifs accurately for engraving. The patterns were roller printed rather than screen printed, because the fabric was intended to be mass produced and sold at low price points—less than $2 a yard—for use by both garment manufacturers and home sewers. Each artist approved the final patterns derived from his work and was involved in the selection of the colors. Marketing was a key element of the project. The Modern Master Series was launched in the fall of 1955 with both a museum exhibition as well as a documentary film that featured the artists in their studios, the original works of art, the finished fabrics, and the production process. The exhibition and film opened at the Brooklyn Museum and then traveled to other American museums. For a five page editorial spread in Life magazine, “Modern Art in Fashion,” Life’s fashion editor, Sally Kirkland, enlisted the participation of her friend, fashion designer Claire McCardell. McCardell designed a wardrobe of separates and dresses using Modern Master fabrics, which were featured in the Life photo essay. The collection of 60 designs was much celebrated when it was launched. American Fabrics applauded Fuller for its daring and courage in bridging “the abyss” between fine and applied arts. At the time of proposed acquisition, the museum holds six other fabrics from Fuller’s Modern Master Series in its collection: The Bullfight, Birds, and Poisson by Picasso; Vitrail by Léger; Femme Ecoutant by Miró; and Evening Enchantment by Chagall. 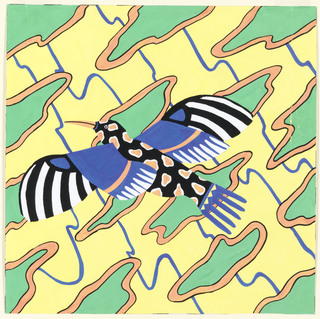 The source motif for this complex pattern is a simple bird from a ceramic plate by Picasso. The repeated images are cleverly arranged such that the pattern appears almost random, demonstrating how a modest motif can be used to create an intriguing and intricate design. In 1947, Picasso spent the summer in the Vallauris region of Southeast France, which had been a center of ceramic production for more than 2000 years. Fascinated by the town’s ceramic history, as well as the inspirational work of Vallauris’ contemporary potters, Picasso devoted himself to learning to throw clay vessels. He became a passionate and prolific potter, making thousands of jugs, vases, dishes and platters with a wide range of decorative schemes. Living things from the earth, sky, and sea, like the bird on this plate, were a recurring theme. Picasso’s ceramics were intended to be models for mass production, but this plan was abandoned because Picasso’s originals were more highly valued as unique, luxury collectors’ items. The charming bird from one of his plates finally found its mass audience as source motif for this print in the Fuller Fabrics’ Modern Master Series. Geoffrey Rayner, Richard Chamberlain and Annamarie Stapleton, Artists’ Textiles: Artist Designed Textiles 1940–1976 (Woodbridge: Antique Collectors’ Club, 2012), 139. "Trying abstraction on fabrics; adaptations from Picasso, Miro, and Léger." Artnews 54, (November 1955): 43. Kohle Yohannan, and Nancy Nolf, Claire McCardell: Redefining Modernism (New York: Harry N. Abrams, 1998), 126. "Fine arts and textiles come to terms." American Fabrics no. 35 (January 4, 1955): 49. It is credited Gift of Fuller Fabrics Corp..